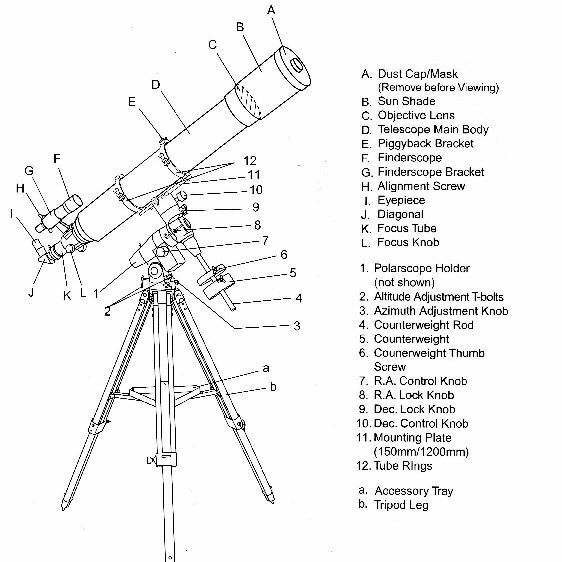 The diagram above shows a typical telescope assembly with the main parts identified. First a safety notice. 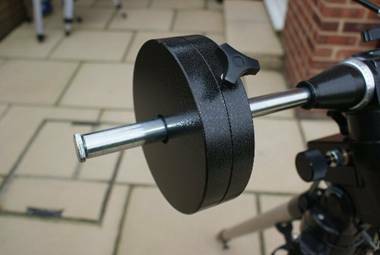 If assembly is to be conducted outside in daylight then the Dust Cap [A] must be fitted to avoid sunlight entering the tube and causing damage to the components or injury to the person who is assembling the telescope. 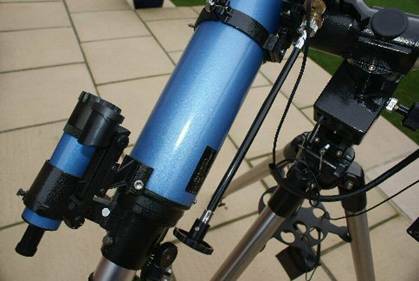 In this article the guidance is of a general nature as each telescope has differences in design depending on the supplier and the components used. 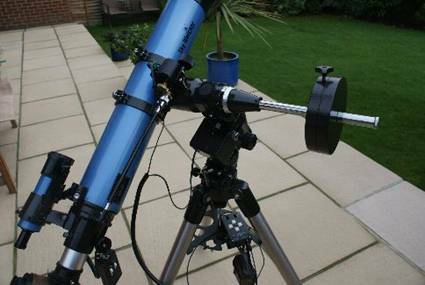 Illustrations are from the assembly of a Skywatcher 120mm f1000 refractor fitted to an EQ5 Equatorial Mounting and Field Tripod. On receiving the new telescope open the package and check that all sub-assemblies and components are present according to the list in the instructions. Read the instructions as these may be good and enable the telescope to be assembled without any problems. The guidance in this magazine should be used as additional help or if problems are encountered. When using these instructions first identify the equivalent sub-assemblies and components supplied with those shown in the diagram above, they may not be identical but should look similar. When this has been done assembly can begin. First assembly can be done indoors or outdoors but if it is to be done outside in daylight take special note of the safety notice at the beginning of this article. 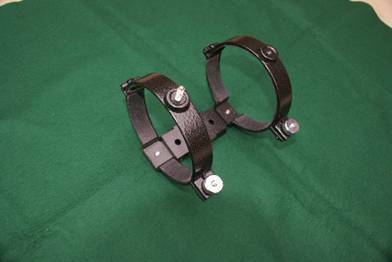 Position the Leg Spreader on the lower Hand Nut with the strengthening webs at the bottom and the leg notches located on the legs. Tighten the Hand Nut until the legs are rigid. Do not over tighten the Hand-Nut or it may damage the Leg Spreader. 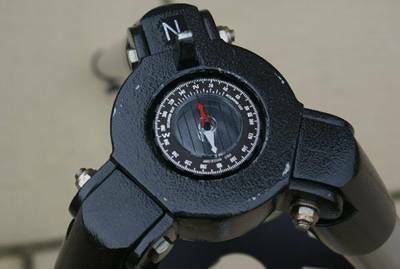 Using a compass to identify north, rotate the tripod so that the marked north position is pointing approximately north. It will be necessary to align and level the stand more accurately for first observing session. We will be covering this aspect in the first use of the telescope article. 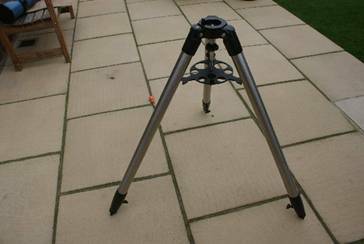 On the tripod mounting head shown in Figure 3 there is a fine alignment peg at the north position. This is used to carry out fine alignment on north for observing. During first assembly if a notch is present make sure the two adjusters on the equatorial mounting base are unscrewed so they do not interfere with fitting. Before proceeding with the next operation tighten the RA Lock Knob  and the Dec Lock Knob  to prevent inadvertent rotation. If not already fitted (as shown in Figure 4) fit the Counterweight Rod . Remove the Counterweight safety screw from the end of the Counterweight Rod. Slide the Counterweight on to the Counterweight Rod and secure using the Counterweight Thumb Screw . Re-fit the Counterweight safety screw on to the Counterweight Rod. The Tripod and Equatorial Mounting are now ready to receive the Telescope Optical Tube Assembly. 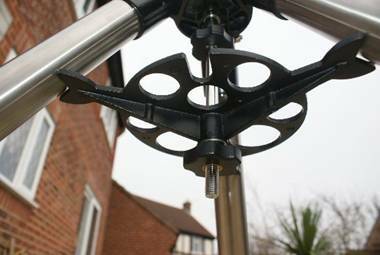 If the type of tripod shown in the opening diagram is supplied then it should be assembled as follows: Open the Tripod Legs [a] while raising the hinged Spreader Arms. When the Spreader Arms are fully extended position the Accessory Tray [b] on top of the Spreader Arms. Align the holes in the Accessory Tray with the holes on the Spreader Arms and fit the securing screws. Pull the legs out to fully tension the legs and produce a rigid assembly that is ready to fit the Equatorial Mounting. 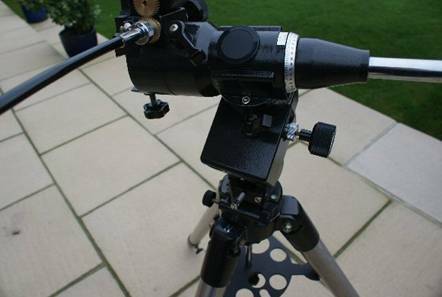 Most telescopes use a system of Tube Mounting Rings , Mounting Plate  and a ‘Dove Tail’ location to fix the Optical Tube Assembly (telescope) to the mounting. Before starting to assemble the components to fit the Optical Tube Assembly to the Mounting, the mounting must be positioned in the orientation in which it will be used. This does depend largely on the design of the mounting. We must ensure the Drive Control Knobs do not interfere with the movement of the telescope and they are easily accessible when using the telescope. Most observing will be done with the telescope pointing towards the south with a view sweeping from east to west. So it helps to set up as we expect to observe. To continue the assembly process we need to fit the finder. There are two types of finder supplied with modern telescopes. 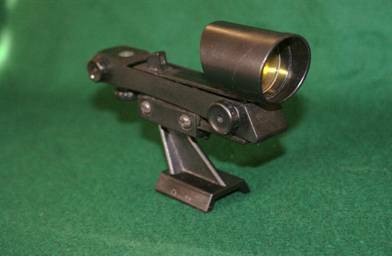 These are: a small conventional telescope or a Red Dot Finder. Conventional telescope finders may typically be 7 x 30 or 9 x 50 (magnification x aperture) and other combinations. To assemble the Finder Scope shown in Figure 14 fit the rubber ring into the groove on Finder Scope tube. 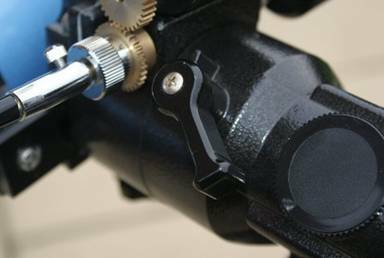 Loosen the two adjusting screws on the Mounting Tube and pull up the spring loaded location pad. Push the Finder into the Mounting Tube until the rubber ring engages into the groove on the inside of the mounting tube. Release the spring loaded location pad and tighten the two adjusting screws until they lightly hold the Finder Scope centrally. Fit the finder into the ‘Dove Tail’ mounting on the telescope and tighten the securing screw. The main assembly sequence is now complete and the new telescope is almost ready to use. However before use we need to make a few adjustments to balance the telescope. First we can balance the Optical Tube Assembly. To make sure the balance is correct we need to fit an Eyepiece into the Focuser Assembly. Loosen the small thumb screw on the side of the focuser tube. If fitted remove the dust cap from the focuser and fit the Eyepiece. Tighten the thumb screw to secure the Eyepiece. 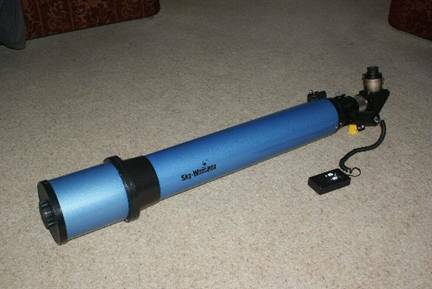 Make sure the telescope is not pointing towards the Sun and remove the Dust Cover from the end of the Tube. Support the tube and release the Dec Lock. Carefully let the tube swing up or down a little to indicate which end is heaviest. Slacken off the Tube Mounting Ring Clamp Screws. While rotating the tube back and forth slightly, slide the tube through the Tube Mounting Rings towards the lighter end. Let the tube swing up and down again to check the balance. Repeat the process until the tube does not swing up or down. Re-tighten the Tube Mounting Ring Clamp Screws and the Dec Lock. To balance the RA axis support the tube assembly (make sure the Dec is locked) and the Counter Weight Rod is horizontal as shown in Figure 18. 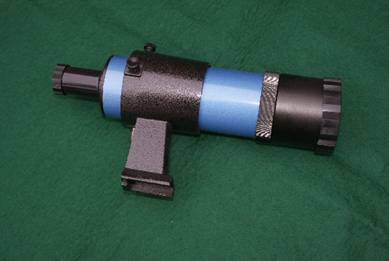 Support the Optical Tube Assembly to prevent inadvertent rotation. Release the RA lock and allow the Tube and Counter Weight Assembly to rotate slightly. If the Optical Tube Assembly moves down move it back to horizontal and engage the RA Lock. Loosen the Counter Weight Clamp Screw and slide the Counter Weight further along the Rod. Repeat until rotating assembly is balanced. The telescope is now ready for use and we will be looking at the final adjustments that need to be made in the first use article. In the next article we will be looking at setting the telescope up for observing the first time. 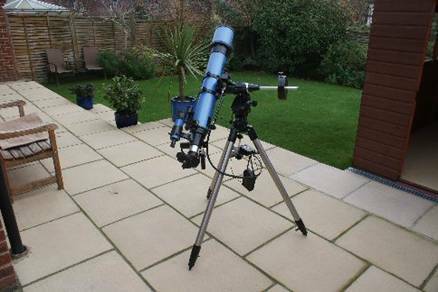 Some telescopes can have additional upgrade equipment supplied when purchased at additional cost. Alternatively upgrades can be bought separately at a later stage. Here are a few words about those extra components that are most often supplied with the telescope package. One very useful extra is an electric drive on the RA axis. This allows the telescope to track an object as it appears to move across the sky due the rotation of Earth on its axis. There are many ways that the drive system is fitted depending on the design of the mounting. Some have a small motor that replaces the RA Control Knob . Some mountings have a special motor bay designed into the Equatorial Mounting. 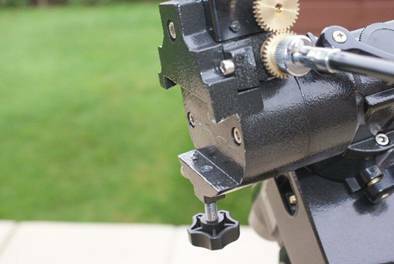 The telescope assembled in this article does have a special bay for the RA Motor. It also has a drive on the Dec axis but this is a relative luxury compared to the RA Drive. 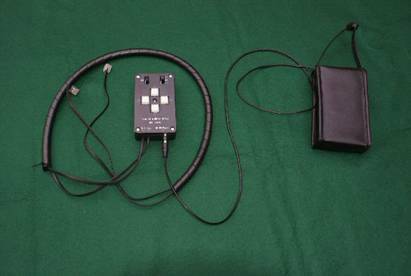 The Drives with the Control Box and Battery Pack shown in Figure 19 were supplied with the telescope. 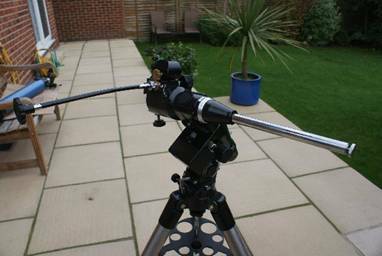 In Figure 20 the Control Box and Battery Pack are shown between the legs of the Tripod. The RA Dive Motor is housed in the square black compartment with the cable connected. See Figure 18 for a closer view of the RA Motor Bay. The Dec Motor is fitted on the top of the Mounting close to the Dove Tail location. It can be seen closer in Figure 9 and 18. The motors can be disengaged using the silver knurled knob on the RA and Dec Hand Control Knobs.